Disgraced Vice President Spiro T. Agnew officially becomes a private citizen and addresses the nation one last time... as a convicted criminal. Now do one on the Clinton foundation. Kick backs and money laundering, but I haven’t seen any prison time! There is a great deal of history, ours, as well as that of other places on the globe, that has not been thoroughly documented. Has it intentionally been buried from future public view by those who were possibly affected by its outcomes or shamed by its alleged facts? Perhaps, due to the possibility, risk, or question of whether such not-so-well-known events, like those of BAGMAN's Spiro Agnew reoccuring, a political scientist with the curiosity of a Rachell Maddow, shows up to ask the question, 'I wonder if this happened before . . . when ? . .to whom ? . .why .?.. and how does that outcome affect our actions and decisions now?" I for one am grateful for Rachell's broad political science expertise, her focused research leadership, her curiosity and her intention to use technology, creative story-telling techniques, the best of corroboration partners and the excitement to educate us and incite us to get involved. Thank you, Rachell, for telling me of a time when I was too busy to pay attention. Great example of the truth of an old adage, if we do not learn from history we are doomed to repeat it. That statement no more true or relevant than today. Thank you much for this amazing story. You give me hope for our near future. WOW!! I lived through this and I didn't know half this stuff! Very informative and detailed, more information than was released at the time. I've always been a political junkie and this was a wonderfully written story about an extremely tumultuous period of our country. A lesson we all should be learning as it so closely is echoed in our current administration's actions. Thank you for clarifying what happened all those years ago. An Excellent job! I was a young wife & mother and couldn't totally get my head around it then. Bring on Trump - we can and will prevail! Awesome series. Rachel and the producers did a great job on this. Excellent job on the podcast series! Our family appreciates everything you do Rachel. Please consider doing more podcasts, which we can't get enough of. Thank you to all involved! Rachel is a Smart Smart Lady she's the Bomb delio dealio! More please. An excellent job by all involved! This was an absolutely fascinating and gripping podcast. Thank you for this and have recommended it highly. Rachel you and your researchers are super interested and DO a great job. Rachel- best storyteller in broadcasting. Bagman proves it! This would make one hell of a movie! I learned so much. 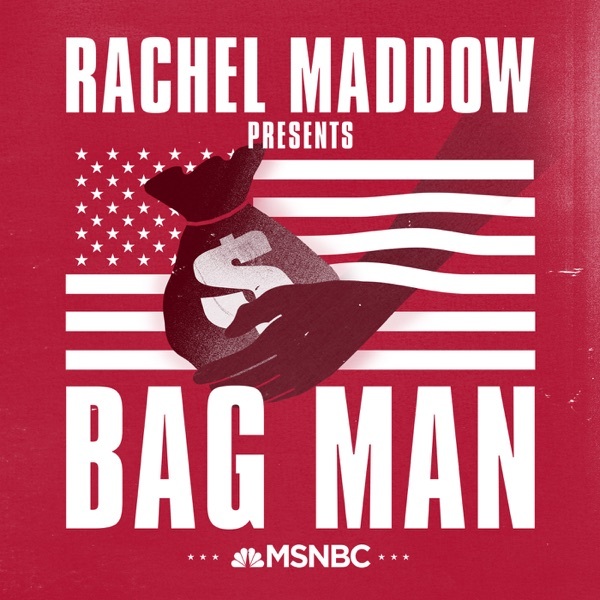 Rachel Maddow is one of the great story-tellers ever, and this podcast has made for gripping, and tantalising serial! Love!The best podcast I have listened to. Thank You!